Rev. Joan Van Becelaere serves as the District Executive for the Ohio-Meadville District. She has served in this position since July 2007. Previously, Rev. 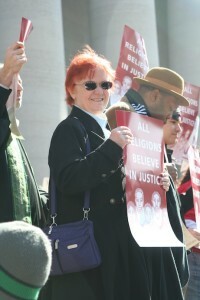 VanBecelaere was Vice President for Student Services at Iliff Theological School in Denver, CO where she also taught Unitarian Universalist history and polity classes. She has extensive experience with Unitarian Universalist congregations including serving as the Settlement Representative in the Mountain Desert District. She has previously served on the Unitarian Universalist Minister’s Association (UUMA) executive committee and on the UUMA’s Center Committee responsible for the continuing education of ministers. She has been teaching leadership development for almost a decade including service at two of our Unitarian Universalist leadership schools. Her BA is in Theater and Communication Arts from Lindenwood University in St. Charles, MO, her MPA in Public Policy Analysis from the University of Colorado – Denver, her M.Div from Iliff Theological School. In her spare time she loves to perform Dr. Seuss stories.